My wife and I recently had the opportunity to get away from Texas for a few days of snowshoeing in western Colorado. We had snowshoed in Colorado many times, but never west of the Continental Divide by more than a few miles. Now that the holidays have come and gone, this is a good time to focus on the snowshoeing season. This will be the ninth year of senior snowshoeing adventures for my wife and me. We eagerly await the feeling of snow crunching under our snowshoes, or silent steps into new fallen powder. We have snowshoed in different parts of Colorado, New Mexico, and Utah. A couple of times, when heavy snow fell unexpectedly here in North Texas, we astonished the locals by using our snowshoes to travel around. That gave us the chance to tell those who were puzzled all about how much we love snowshoeing. We want to revisit some of those favorite places and possibly try some new ones in the Sierras and Cascades. My wife and I have been to Red River several times for both summer and winter vacations. It has long been a favorite spot for Texans to escape the dreadful summer heat that is inevitable. Affordability and close proximity have always been major draws-not just to Texans. From our home in Denton (40 miles north of Dallas) we can be in Red River in less than twelve hours. Due to its small size and location slightly off the beaten path, Red River is sometimes overlooked by Texans looking for a mountain getaway. Early in 2006, my wife and I began planning our annual February snowshoeing trip. By going in February, we find that snow conditions are usually good and we avoid the spring break crowds and prices that begin in early March. After snowshoeing in Colorado and New Mexico the three previous winters, we decided to try Utah for a new snowshoeing experience. Having gone to Utah for a couple of ski trips in the early 90's, we were impressed by that wonderful dry Utah powder- and lots of it. With a bargain air fare to Salt Lake City, we were off for a week of fantastic snowshoeing. One trail pass. Three Nordic centers. Unlimited snowshoeing fun. That's what you can expect in Summit County, Colo. All of this is conveniently located in a 10 mile area about 80 miles west of Denver. The scenery is spectacular, the people are friendly, and the snowshoeing is first rate. What more could a couple of Texas snowshoers ask for? On a recent snowshoeing trip to Summit County, Colorado, my wife and I were able to visit three different nordic centers within a span of three days. Gene and Therese Dayton own two of the centers, Frisco and Breckenridge. Both of the centers are well-established and attract a sizable number of both cross-country skiers and snowshoers each year. My wife Liz and I were looking for a location for a quick, early season snowshoeing trip in early December of 2004. Having visited the Enchanted Forest Cross-Country Ski and Snowshoe Area for two days last year, we decided to return for a slightly longer stay this time. Enchanted Forest is located at the southern end of the Sangre de Cristo Mountains in north central New Mexico. It is just off Highway 38, about four miles east of Red River. In September of 2004, my wife Liz and I hitched up our travel trailer and headed for the mountains of Colorado to hike, trout fish, leaf peep, and bum around like retired folks are prone to do. An attractive RV park in Buena Vista became home for the whole month. Located in the Arkansas River Valley, Buena Vista is aptly named. 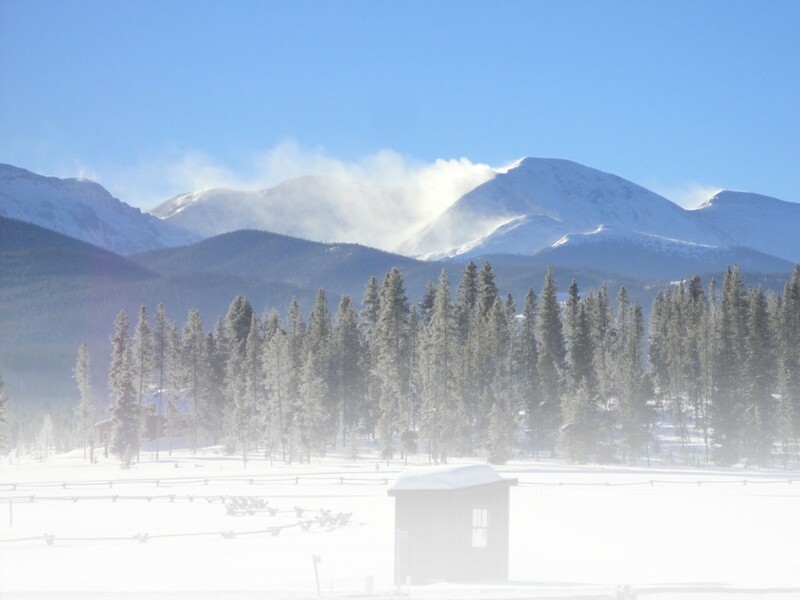 The views of the Sawatch Range to the west are truly spectacular. Whether you are an active senior on a budget or a thrifty person of any age who loves the outdoors in the winter, then the growing sport of snowshoeing is for you. My wife, Liz, and I are in our early sixties and are always in search of a new adventure. We used to go alpine skiing in Colorado and Utah. As we became more "mature", however, we began looking for an activity with aerobic benefits that was easier on the joints than downhill skiing.